UN Humanitarian Coordinator for Afghanistan, Mark Bowden (left), and the Country Representative of the Office of the UN High Commissioner for Refugees (UNHCR), Bo Schack (centre) visiting south-eastern province of Khost. The conflict in Afghanistan is “partially forgotten,” the former United Nations Deputy Special Representative for the country has warned, calling for more aid for displaced families and a greater focus on bridging the poverty gaps. “Afghanistan has been one of the most protracted crises, and I think people don’t realize the casualty rates that we’re dealing with here are second only to Syria,” Mark Bowden said in his last interview with UN News before leaving in late February after more than four years as the deputy of the UN Assistance Mission in the country (UNAMA). At least 3,489 civilians were killed and 7,920 wounded in 2016, due in part to an increase in air raids, and attacks by the Taliban and the Islamic State of Iraq and the Levant (ISIL/Da’esh), according to UNAMA. “I am worried that the situation has deteriorated in terms of the large numbers of displaced people that we see, but also in terms of the number of civilian casualties that take place,” Mr. Bowden said. “We have seen a year-on-year increase in civilian casualties which just demonstrates that civilians are the most affected by the war. As the war progresses and appears to deepen, then I think there is a real cause for concern,” he stated. In 2016 alone, more than half-a-million Afghans fled their homes and sought shelter elsewhere within the country’s border. Of those 580,000 people, about 56 per cent were children under the age of 18, according to Afghanistan’s statistics on internally displaced persons (IDPs). By mid-2016, UNAMA reported that a total of some 1.2 million people were now IDPs, some since 2002. Mr. Bowden noted that there are plans in place to more quickly integrate IDPs and returnees, but said that he would have liked to have seen more progress in how displaced families are supported. In his capacity, Mr. Bowden was also the UN Humanitarian Coordinator for Afghanistan, overseeing the UN agencies, funds and programmes working with national authorities and local partners to feed families, vaccinate children, build roads and develop clean water policies, among other responsibilities. The UN has said that it is able to reach at least 5.7 million people out of an estimated 8.4 million Afghans that are living in contested areas. “I visited a camp recently where the population are beginning to be re-housed and to be better established. I also see a lot of progress in terms of a number of the development policies that have been instituted and quite substantial change in terms of the management of the country and the ability of local government to provide better services to its people,” Mr. Bowden explained. “I’m always aware here that it’s the Afghan people who really are providing the most support in humanitarian terms. Either in terms of looking to support relatives or family that have been displaced, or, in terms of natural disasters, also giving assistance to families affected by natural disasters. Humanitarian assistance is a secondary effort. So, I think that we rely very heavily both on the Afghan people and the Afghan Government to shoulder a lot of the burden of meeting what are increasing humanitarian needs,” he said. Despite heavy investment, the lives of millions of Afghans have not substantially improved and the number living in absolute poverty is rising. This year, the UN predicts that some 9.3 million Afghans will be in need of humanitarian assistance. For Mr. Bowden, who returned to his native United Kingdom for “a fairly active retirement,” the memories that linger are of concern for the Afghan people. “I visit a number of trauma centres and hospitals because the humanitarian work has tried to focus on getting better and more accessible treatment for the casualties of war. One of my most disturbing images is of a young boy who had been an innocent victim of a suicide bomb attack and had lost an eye and his hand and was just there totally astounded by what had happened to him. His life is irreparably changed. And although we were able to ensure that he got trauma care, the fact of seeing so many innocent people affected by conflict in such a deep way will stay with me,” Mr. Bowden said. 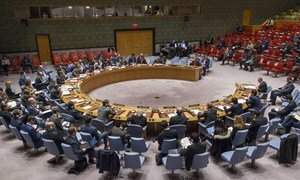 The Security Council today extended the mandate of United Nations assistance operation in Afghanistan until 17 March 2018, stressing the political mission’s role in supporting an inclusive Afghan-led and Afghan-owned peace process.